-Make the cancellation of the payment of the total of days of lodging to make the reservation. - Book before 2 days. 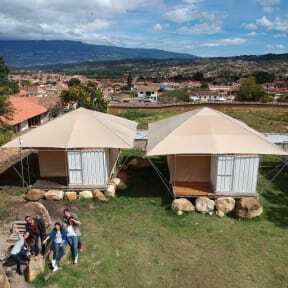 Mirari Glamping is a hostel located in Villa de Leyva just 3 blocks away from the main square, is a glamping type accommodation with tents equipped with comfortable beds, energy, internet access, with private bathroom and hot shower. Is shared acomodation in rooms (glamping) for max. 6 people. We provide bonfire services, hammocks, social room, kitchen use, green areas, internet access, social toilets, board games, cable TV, showers with hot water. We are located in Villa de Leyva just 3 blocks from the main square. In a block of the 'Plaza del Mercado' on an open street in front of the hotel 'El Duruelo'. In a large green door with white walls and you can see a blue tent over the walls. The rooms are glamping type of 16 square meters. It is shared accommodation in rooms (glamping) for max. 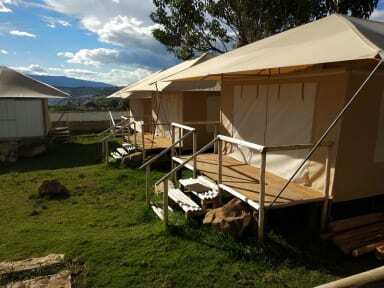 6 people Each glamping or room (camarote) (6 single beds) and has its own bathroom with hot shower. It has energy, Internet access and a reading light in each bed. The room has a shared terrace and a hammock zone. People can cook in the kitchen and keep their things in the freezer.